Released in March 1969 by Polydor Records in the UK and Atco Records in the US, it was the group's fourth album released internationally, their sixth overall, and their only double album of original music. Odessa would be the final album for the band's original incarnation, and this was the last album to include guitarist Vince Melouney. The album contains "First of May", "Lamplight", "Marley Purt Drive" and "Melody Fair". The album was reissued as a single-disc in 1976 when interest was revived in the Bee Gees career, since then the album has gained increasing critical acclaim; it was reissued again in 2009 as a deluxe 3 disc set, and is included in 1001 Albums You Must Hear Before You Die. Colin recalls about the country influence on Odessa. "It was my idea that we do that sort of thing, and Maurice is the one who will take more time out to listen to what I have to say, although within the group, the okay has to come from Barry". Their manager Robert Stigwood says, "Barry is the Bee Gees coordinator, I used the word advisedly, as there is no leader of the group as such. He has a tremendous feel for soul music a la his composing work for The Marbles, but he is also a fantastic solo singer in his own right". The first song recorded for the album was "I Laugh in Your Face" on 12 July 1968, the same day the group recorded "I've Gotta Get a Message to You" (released from the American version of the group's fifth album Idea). After recording eight songs for the album, guitarist Vince Melouney left the group amicably and joined the group Fanny Adams, wanting to pursue a more bluesy direction. A reel tape of mono mixes dated 24 November 1968 has "Odessa (City on the Black Sea)", "First of May" and "Melody Fair" called a "rough mix with orchestra". Therefore, about as soon as they returned to the studio, they were with Bill Shepherd arranging and conducting orchestral tracks to complete the album. This puts the re-make of "First of May" early in the November sessions, yet the song would be the last Bee Gees band session for the album. However, after recording "First of May", the instrumental tracks, "Seven Seas Symphony", "With All Nations" and "The British Opera" were recorded by Bill Shepherd. Also done somewhere around here are the final vocals for the New York songs and the added organ part for "Edison". Odessa was initially released on Atco Records in a red flocked cover with a gold lettering to the group's name and label symbol stamped in gold on the front and nothing but the flocking on the back. The gatefold has a large dotted image of people leaving a ship in a lifeboat. There are no photographs of the group and they are not named except as to all songs being written by B, R & M Gibb. Due to the high cost of production, as well as allergic reactions among workers during assembly, this design was discontinued. The last performances of the group including Robin were in early 1969, when they performed "First of May" (they also performed "I Started a Joke") on The Tom Jones Show (21 February) and Top of the Pops (6 March). Robin left the band on 15 March and made his decision public on 19 March. Robin told Mojo magazine in 2003 about his departure from the band after the release of Odessa saying "We had egos". Maurice later described the album as 'heavy'. "People thought it was an in-depth album", he recalled, "like, 'What do they mean by those lyrics?' and 'What's this all about?' There's all sorts of different areas on it. It went up and down in places, but a lot of people regard it as our Sgt. Pepper. To us, I don't think it was the best album we made, but the main title 'Odessa' I loved". Barry responded to Maurice saying, "I guess I have strong personal feelings about it because it was a time when the group was splitting up". In July 1969, "Marley Purt Drive" was released as a single, backed with "Melody Fair" only in South Africa. The album was reissued in 1976 as an edited single-disc album with a plain red cover on RSO Records. The 1976 single LP reissue deleted tracks 3, 5, 7–9, 12, and 17. Some early CD and cassette editions also omitted the track "With All Nations (International Anthem)." On 13 January 2009 Rhino released a deluxe remaster of the album containing three discs containing, respectively, the album in stereo, the album in mono and selected rarities. The third disc, entitled Sketches for Odessa featured demos of the songs plus a vocal take of "With All Nations (International Anthem)" and the previously unissued tracks "Nobody's Someone" and "Pity." This edition restored the red flocking originally found on the LP. On 13 January 2009, Reprise Records released a 3-CD set of Odessa, complete with remastered stereo and mono version of all 17 tracks, plus a bonus third disc with demos, alternate version, and three unreleased tracks. To date, Odessa was the last album to receive the deluxe remaster treatment with extensive sleeve notes, and the status of the re-release program is unknown. ^ a b Brennan, Joseph. "Gibb Songs: 1968". Retrieved 12 April 2013. ^ a b Walters, Barry (5 February 2009). "Odessa [Expanded Version]". Rolling Stone. Retrieved 7 May 2016. ^ Iain McIntyre (2006). Tomorrow Is Today. Wakefield Press. p. 133. ISBN 9781862546974. ^ Robert Dimery (5 Dec 2011). 1001 Albums You Must Hear Before You Die. Hachette UK. p. 165. ISBN 9781844037148. ^ a b c Marion Adriaensen (25 November 1966). "History Part 4". Brothersgibb.org. Retrieved 7 April 2014. ^ a b Hughes, Andrew (2009). The Bee Gees – Tales of the Brothers Gibb. ISBN 9780857120045. Retrieved 21 July 2013. ^ Coston, Daniel. "Excerpt from new Vince Melouney (Bee Gees) interview". The Coston Chronicles. Retrieved 11 April 2013. ^ Classic TV Archive. "This Is Tom Jones (1969-71)". Retrieved 17 February 2016. ^ Nostalgic Music TV. "Top of the Pops - The Full Shows 1966-1970". Retrieved 17 February 2016. ^ Brennan, Joseph. "Gibb Songs: 1969". Retrieved 17 February 2016. ^ "Robin Gibb, 1949 – 2012". Mojo. Archived from the original on 27 May 2012. Retrieved 18 February 2013. ^ "Bee Gees – Marley Purt Drive / Melody Fair". 45cat. Retrieved 12 April 2013. ^ Totale, Todd (10 December 2008). "Lost Classics: Bee Gees – Odessa". Glorious Noise. Retrieved 4 March 2012. ^ "Bee Gees: Odessa | Album Reviews". Pitchfork. 11 February 2009. Retrieved 7 April 2014. ^ Brusie, David (12 February 2009). "Bee Gees – Odessa | DeLorean". Tiny Mix Tapes. Retrieved 7 April 2014. ^ Alexis Petridis (30 January 2009). "The Bee Gee's Odessa file". theguardian.com. ^ a b Bruce Eder. "Bee Gees Odessa". allmusic.com. ^ Luke Torn (13 February 2009). "Spellbinding restoration of the Gibb masterpiece". uncut.co.uk. ^ Kent, David. Australian Chart Book 1970–1992. Australian Chart Book. ISBN 0-646-11917-6. ^ "Top Albums/CDs – Volume 11, No. 9". RPM. 28 April 1969. Retrieved 5 May 2013. ^ "InfoDisc : Tous les Albums classés par Artiste > Choisir Un Artiste Dans la Liste" (in French). infodisc.fr. Archived from the original on 7 November 2011. Retrieved 1 May 2013. Note: user must select 'Bee Gees' from drop-down. ^ "Bee Gees > Artists > Official Charts". UK Albums Chart. Retrieved 5 May 2013. ^ "Allmusic: Odessa : Charts & Awards : Billboard Albums". allmusic.com. Retrieved 5 May 2013. 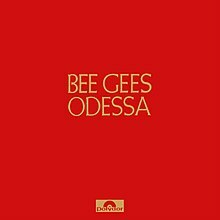 ^ "Album Search: Bee Gees – Odessa" (in German). Media Control. Retrieved 6 May 2012. ^ "Les Albums (CD) de 1969 par InfoDisc" (in French). infodisc.fr. Archived from the original (PHP) on 2 January 2016. Retrieved 5 May 2013. ^ "Hit Parade Italia – Gli album più venduti del 1969" (in Italian). hitparadeitalia.it. Retrieved 5 May 2013. ^ "Billboard.BIZ – TOP POP ALBUMS OF 1969". Retrieved 12 October 2012. "Odessa (City on the Black Sea)"
"You'll Never See My Face Again"
"I Laugh in Your Face"
This page was last edited on 10 February 2019, at 10:35 (UTC).